XYZ piezo nanopositioning stages by PI are based on two design principles: seriel kinematics (stacked or nested) and parallel kinematics. Parallel kinematic approaches provide lower inertia with faster response and also allow for the implementation of parallel metrology position feedback leading to higher overall precision. Serial kinematics are easier to design and manufacture and hence somewhat less costly, parallel designs provide higher overall performmance. The P-313 PicoCube XYZ nanopositioning scanning stage is based on a novel crystalline, leadfree piezoelectric material which differs from classical PZT piezo material. The P-313 features a particularly high motion linearity enabling ultra-high precision positioning without feedback sensors and closed-loop control. It was designed for applications which combine high dynamics, small travel and ultra-high precision requirements. 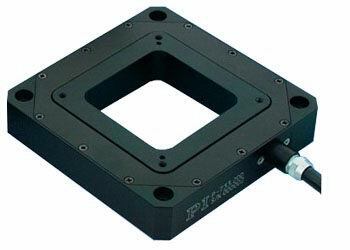 The P-363 PicoCube is a compact and rugged XYZ nanopositioning stage providing ultra-high-performance in closed-loop operation. It is designed for scanning probe microscopy and nanomanipulation applications. Combining a stiff high-speed XYZ piezo scanner with non-contact, direct-measuring, parallel-metrology capacitive feedback it is capable of better than 50 picometers resolution. 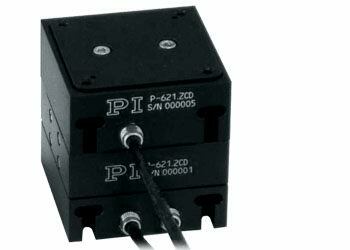 The PicoCube can be operated by the E-712 digital controller or the E-536 PicoCube controller. A)	High-speed, direct-drive scanner for fast scanning and tracking applications (e.g. single particle tracking). 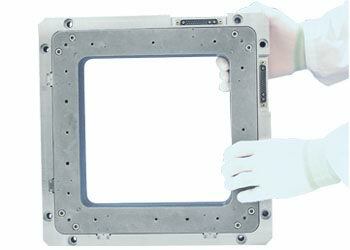 Its direct drive system features 30x30x10µm closed-loop travel, 0.1 nanometer resolution and extremely fast response. B)	Long Travel (100x100x10µm) for standard nanopositioning applications. Both feature parallel-metrology with capacitive feedback for highest multi-axis precision, stability and linearity. XY versions are also available. 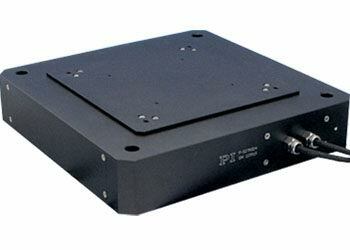 This high-dynamics piezo nanopositioning stage was designed for high loads and vacuum environments. Parallel-metrology with capacitive feedback guarantees highest multi-axis precision, stability and linearity. 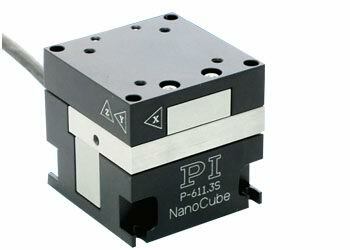 It is an example of PI's custom nanopositioning stage capabilities. Providing a travel range of 100x100x100µm and 1 nanometer resolution, it can handle loads to 50 kg. The minimal inertia and stiff piezo flexure system help to boost speed and throughput in device characterization applications. 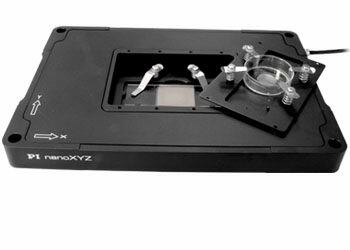 PInano XYZ and XY piezo stages are affordable high-precision nanopositioning systems optimized for scanning microscopy. The new models are equipped with direct-measuring capacitive sensors. This type of sensor can provide higher linearity and long term stability than the lower cost piezoresistive sensor-equipped stages which are still available. Capacitive sensors are also less sensitive to noise due to a high-frequency measurement principle as opposed to the DC-based sensing technique used in piezoresistive sensors. The net effect is similar to the higher performance of FM radio compared to the more noisy AM radio. PInano stages feature a low profile of 0.8 inches (20mm) for easy integration and a large aperture for Petri dishes and microscope slide holders. 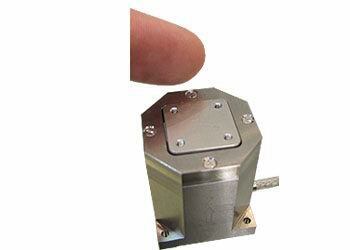 High stability, long travel (200x200x200µm) microscope stage equipped with direct-metrology capacitive feedback. An economical, version equipped with lower cost piezoresistive sensors. All versions are also available in XY configurations. 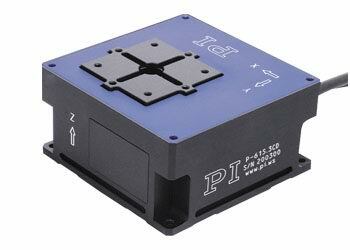 PIHera piezo stages are available as X, XY and Z positioners. They can be combined to form compact XYZ nanopositioning systems. XY travel to 1800 microns (1.8mm) is available and Z-travel to 400µm. All are equipped with direct-metrology capacitive feedback for precision in the nanometer range and below. 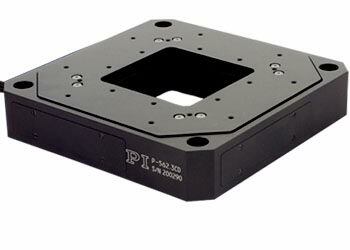 PIHera single axis linear positioners are also available. These piezo nanopositioning stages come in 6 different versions with linear travel ranges to 200 microns per axis and rotation to 4 mrad. The 66 x 66 mm clear aperture makes them well suited for microscopy / transmitted-light applications, optical tweezers etc. Z positioners and Tip/Tilt positioners are also available, custom versions with 6 axes have been built. P-517/P-527 stages have been used in many microscopy, optical trapping and nanotechnology applications. P-517/P-527 stages have been used in many microscopy, optical trapping, and nanotechnology applications. PIMars flexure guided piezo stages are high-end nanopositioning and scanning systems providing very good flatness and straightness in the nanometer range along with sub-nanometer precision. The large aperture is ideal for transmitted-light applications such as optical trapping near-field microcopy, laser scanning / nanostructuring or super-resolution microscopy and mask positioning. It features parallel-metrology with capacitive feedback for highest multi-axis precision stability and linearity. 100x100x100µm, 200x200x200µm, 300x300x300µm (closed-loop range, slightly more in open loop) and a direct drive version for particle tracking with 45x45x15 microns. 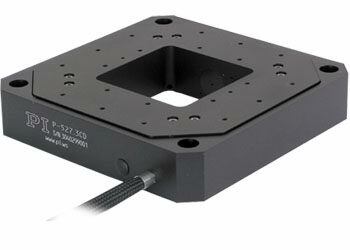 This compact multi-axis piezo nanopositioning stage provides 250x250µm of XY travel and 16 mrad of rotation around the Z-axis. 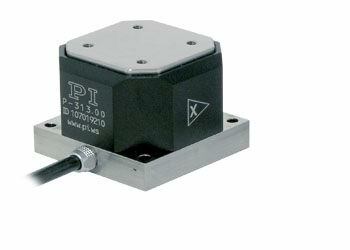 The P-615 NanoCube XYZ piezo nanopositioning and alignment system features a large travel range to 420x420x300 microns. Equipped with a zero-stiction, zero-friction flexure guiding system and capacitive direct metrology, this NanoCube provides motion with ultra-high resolution and settling times of only a few milliseconds. 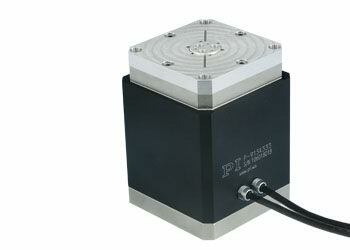 The P-587.6CD is a unique, highly accurate, 6-axis scanning and positioning system based on piezo flexure drives. 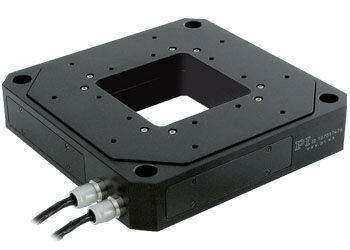 It provides a linear travel range of 800 x 800 x 200µm and rotation ranges up to 10 mrad. 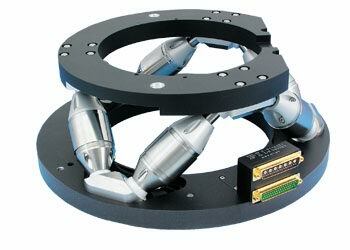 This non-magnetic 6-axis positioner combines the advantages of the parallel-kinematic hexapod approach with the precision and stiffness of the NEXLINE piezowalk linear motors. It can handle large loads and automatically locks the position when powered off. The piezo drives do not exhibit magnetic fields and at the same time are not affected by magnetic or electric fields.